Why the Trial of the NATO3 Trial Should Matter to Us & Why We Need To Support Them! IMPORTANT UPDATE ABOUT ATTENDING THE TRIAL:You can now register to attend the trial the same day you wish to attend. You will need a state issued ID. As we wrote a few weeks ago, these three men were arrested just days before the NATO generals’ conference held here in May 2012, when an apartment in Bridgeport was raided and 11 people arrested, most of whom were soon released. Those arrests became front page headlines alleging “terrorist plots,” just as thousands were preparing to demonstrate. The NATO3 have been in jail awaiting trial ever since. They are facing numerous felonies, including terrorism charges under the never-before-used “Illinois Terrorism Statute,” charges that carry very long sentences. This trial matters for several reasons. First, the Illinois terrorism statute is so vague it can be stretched almost indefinitely. Their lawyers have pointed out that the statute they are charged under uses a definition of terrorism that does not even require an element of force or violence and impinges on First Amendment rights of free speech. When mere words and/or peaceful demonstrations can be defined as acts of “terror,” everyone who understands that political protest and demonstrations are vital must speak out against such prosecution. 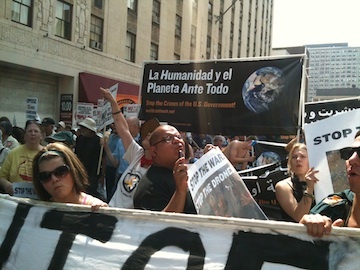 Thousands from around the US and the world demonstrated in May 2012, when NATO met here in Chicago. NATO (North Atlantic Treaty Organization) is a U.S.-led military alliance that bombed Libya and continues to wage war on the people of Afghanistan. It is one piece in the appartus of endless criminal “war OF terror” the US is waging across the globe, a dirty war in which hundreds of thousands have been killed, detained, and tortured. World Can’t Wait and many organizations and individuals rightly took to the streets of Chicago that week in May 2012 to speak out against US and NATO war crimes. Read reports and watch videos of the many powerful protests remembering the victims of NATO, demanding an end to these wars of terror, and the ceremony of US veterans of the Iraq and Afghanistan wars throwing away their medals. The trumped up prosecution of the NATO 3 was and is aimed at shifting the spotlight away from NATO’s crimes and portraying those who speak out against war as the criminals. For months leading up to the NATO conference, the Chicago Police Department and Mayor Rahm Emmanuel fed a media frenzy about the need to “safeguard” the city of Chicago from “violent protesters,” to pass restrictive new anti-protest ordinances, and even re-open an old state prison – all in order to fan public fears. Weeks before NATO, the CPD was already targeting people for surveillance, especially around Occupy Chicago. It is alleged that undercover CPD cops egged on protesters to plan an action and even supplied them with what were later portrayed as “weapons.” The People’s Law Office, which is representing the NATO3 along with National Lawyers Guild attorneys, will argue that they were targeted for their ideology and NOT because they represented any threat to public safety. The government responds to protests with repression, both physical attacks and draconian prosecution, but they are not all powerful. They act out of fear – fear of the people standing up against their crimes, and fear of losing legitimacy in the eyes of millions. Opposing this prosecution politically is just as important as taking it on legally, and this is where we come in, those who know the government will stop at nothing to continue its crimes and suppress those who resist. We must speak out against these outrageous charges and let the public know that a travesty is being perpetrated against these young men for exercising their right to dissent against the crimes of their government. Join us on February 1 for a film screening to raise funds for the NATO3 legal defense (information above).